Volunteers are given the opportunity to get involved in practical conservation and reserve maintenance tasks as well as ecological surveys to help us to conserve the reserve for wildlife and people. During Autumn / Winter volunteers will be able to get involved in practical conservation tasks including coppicing and scrub clearance to help us with our work to restore an area of species rich lowland fen habitat at Moseley Bog. 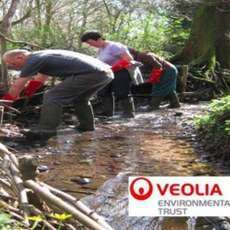 This habitat restoration project is funded through Veolia Environmental Trust.